The Prop Den • The TM ANH facemask and the C-scar. 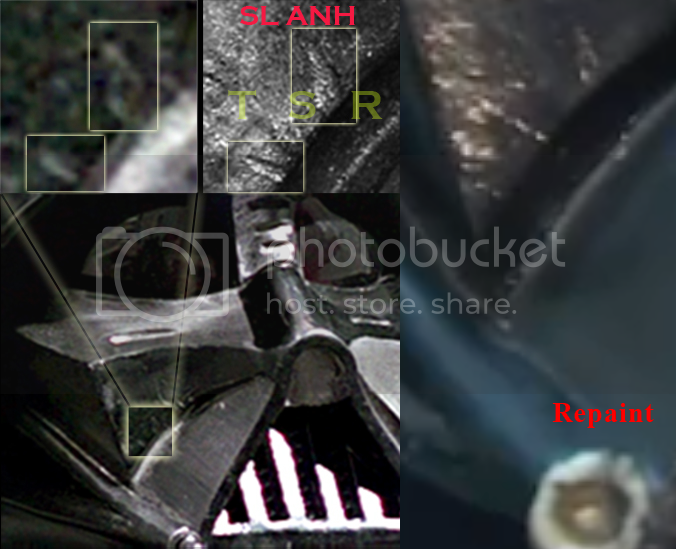 Post subject: Re: The TM ANH facemask and the C-scar. The details you are showing are still visible on the found repainted helmet, so what do you think you are trying to prove with this? And your own images show the different direction repaint brushstrokes too... so honestly... if you only concentrate on things we know is still there and not the things that are missing, then what's the point in discussing this further. I find it interesting how those details are categorically ignored. Even when they are clearly visible in the images. 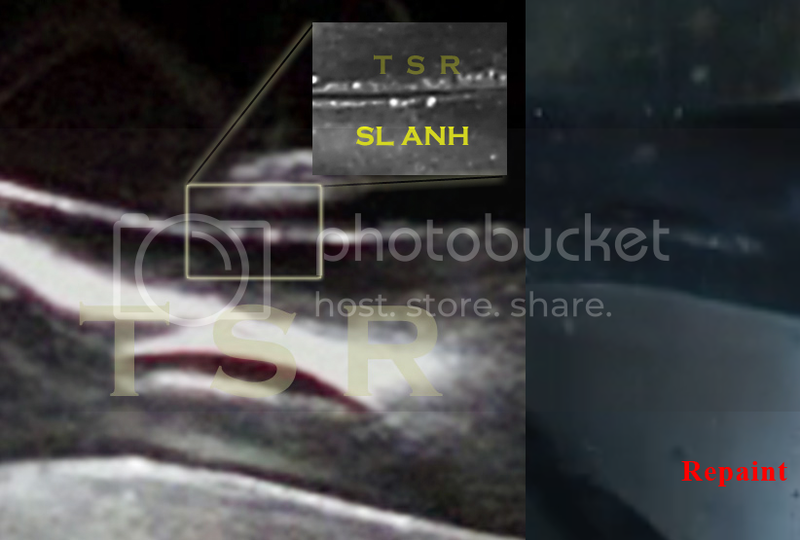 And if your SL is exact to the screen used ANH before the repaint, then how can you claim your TD is the same? Show me then the details I show above that you say are visible in the "repainted helmet". 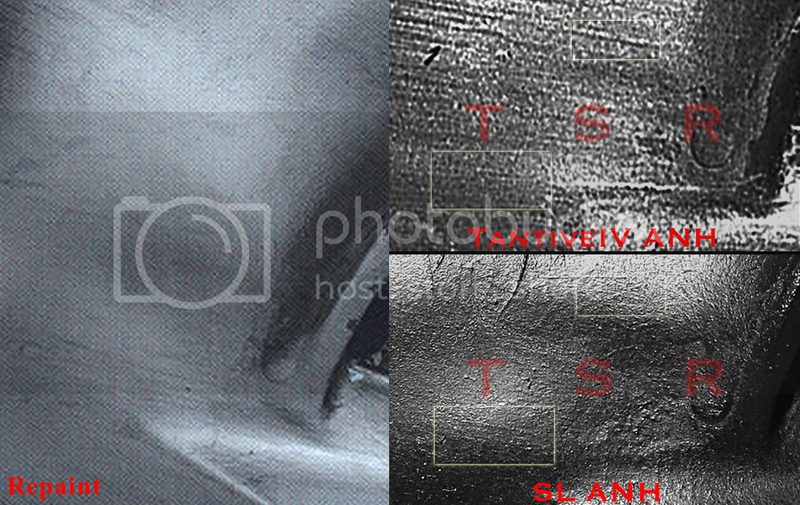 I'm not talking right now about the TD, I'm talking about the SL ANH and your assertion that it is after the repaint. Yes, and cheers, Paul, it's been a while! Is the TM the best helmet ever? Of course not. It's one of the better helmets out there, but there are always going to be better helmets that come along. It was a special helmet back 8 years ago or how ever long it's been and we all learned a lot from it. It was just a shame to see it attacked so much back then. It's not like TM owners were posting pics of it and being elitist trying to show anyone up that didn't have one, but the vader community is filled with scum and villainy and scoundrels. It is what it was. Totally agree. Very special, not only for the face mask but for the dome (2nd run etc). There was and is simply nothing around on offer, even 10 years later for ESB. The TM defined many aspects. Not the best, but still one of them. The SL, TD, VP, EFX, and others also contain imperfections. Agreed as well. I said from the beginning, and knew when I bid on the auction for it, that it was a significant ESB helmet, and it remains THE most significant fan-owned ESB helmet to this day...and yes all the castings have their own imperfections because they are not originals and thus come from particular periods in the history of the molds or castings they came from. Hi Paul, (Lambotour, Thomas, Carsten, JRX, Tom, sorry if I've missed some old friends). Great to see all these familiar faces. I must admit I'm also surprised the "my Vader helmet is more accurate than yours" is still going strong even after all these years. I'm very happy to suggest the SL IS the most authentic ANH mask and helmet, and the TM is the best ESB. I am a TM owner and have no issue with accepting the SL as THE best fan owned ANH. TM and SL owners are amongst some of the luckiest Vader helmet owners on the planet, and a good and decent bunch of fellows to know. It's been a very very tough few years for me including a failed marriage, which is why I dropped off the planet. But it's good to be alive. Things just got a little harder, a week ago I lost my job (redundancy). It's the first time I've been unemployed, not easy at my age. Fatherless One I'm not among the original gang here just having discovered the den a couple of years ago. I've been trying to catch up on all the discussions since 2006, and from that review based on the contributions you've provided that you're an expert and one of the "good guys". Glad to have you back. I was let go a couple of years ago from a job I had for 13 years. In 25 years of constant employment it was a first for me as well. The corporate world has changed a lot, and emphasis on retaining quality people doesn't seem to be as important as hitting the next quarterly earnings target. I've been using that time to refocus, regain my center, and enjoy a sabbatical that I hadn't had the opportunity to take while I was working. This let me devote a lot of time to the things that have provided me a lot of enjoyment and fulfillment since I was a kid which is why I'm on here a lot. And when I'm ready to (or when my savings account balance tells me it's time to), I'll get back into the real world hopefully with renewed motivation and clarity of purpose. Someone asked me a few weeks ago in a text what keeps me engaged in interested in this memorabilia. I told him to large degree it is interest in the artifact itself and understanding its nuances and details to be able to understand it. And as a microcosm is something that can be in embraced completely, compartmentalized, and understood fully (potentially), so it provides an escape and a respite from the real world which often has far too many variables too many unknowns to fully understand. The old adage is true: when life throws you lemons, go get another Darth Vader helmet. ;) And more importantly surround yourself with the people who understand and can relate to your experience. I'm with you here, went through this period (job gone, wife gone) in 2003 - I was completely devastated. But thank the maker there are many good psychotherapists out there. Okay. I am going to honor you one last time and that will be the last time. It is interesting how you are categorically dismissing even the thought of it being from after the repaint, and clearly not even bothered to look into it like, at all. It tells me all I need to know that you are not looking for the truth, but are instead only looking to find evidence that supports your claims. That is absolutely the wrong way to go about things, but shows you have a vested interest in your casts being pre-repaint, either for financial or personal reasons. But it doesn't matter. The real helmet has been found and the truth will eventually come out. If I'm mistaken, then I'll admit I was wrong. Question is: if you are mistaken, will you? Bear in mind that the pictures of the repainted face mask are screen captures or a scan from a book, but it still shows most, if not all the highlighted details that are presented as being accurate only to the screen used helmet prior to the repaint. Also... a picture of a cast shouldn't have to be enhanced to pull out detail when being compared to a screen capture. In all other comparisons the screen capture are usually softer detailed than the picture of the cast - but for some reason that is not the case when discussing the SL. Where's the logic in that? I will however say that I have not found a conclusive image of the left cheek showing the ring and brush strokes. You can sorta make it out in several shots, but the way it is painted and photographed makes it difficult to tell. So I'll concede on that that I haven't been able to provide sufficient evidence that the repaint is only visually covering and not physically covering up the details in that section. The rest are below and should no longer be used as proof that those details are only on the pre-repainted face mask when they clearly aren't. A picture of the cheek. Another one of the cheek showing the "rabbit ear" damage. The sickle-shape and damage on the right side outer mouth wall + downward paint strokes instead of horizontal. This one is a little trickier in the reference used. You can see the sickle shape clearly, and can somewhat see the damage through the printing details from the book, as well as the downward brush stroke pattern only seen on the repaint. And the last one that should seal the deal pretty conclusively. The right side of the head at the eye corner. Notice here where the brush strokes are, where they stop, and where they aren't. Exactly the same on the repaint and the SL. Before this picture, there weren't any pictures of the repainted face mask showing that side of the face - it was always covered by the dome or the face mask photographed from an angle where that side wasn't visible. I was certain the SL was a direct cast off the repainted helmet before... when seeing this, there's no way it can be anything else. Though I'll leave you all to judge for yourselves. I have no vested interest, neither financially nor personally, in any fan made helmet. I no longer own any Vader helmets save for a cut up Rubies Supreme and the vacformed JediJeffrey face mask. I have nothing to gain by saying one or the other. Though, honestly, I don't really care anymore. Time will tell anyway. hi everybody ,i was checking some pictures that you can see the c scar, first photo tantive iv scene , second french original a new hope mask , third image tm mask, all run throught 3d program, to get more detail contrast and bump, makes me wonder all looks real to me,if owners o tm ask i would delete the photo.